Passionate food blogger, Sarah is obsessed with making cooking fun and sharing her love of vegetarian cuisine and devilish desserts. 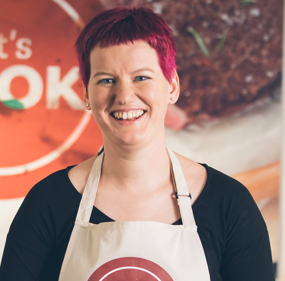 Owner of the Little Pink kitchen, Sarah is our Vegetarian Ambassador and is a fountain of knowledge on all things foodie. Her signature brownies and corn bread are a treat to savour. Sarah lives to cook and her weekend pop-up breakfasts where you can join her in her home for a feast have become well-known with locals and tourists alike. Like all our ambassadors, she is an advocate of using fresh, local produce whenever possible and she can’t wait to share her meat-free dishes with everyone. There are recipes for light lunches and recipes for feasting. There are recipes containing all 5 of your 5 a day (or whatever it is these days), and there are recipes for when you want the opposite of that and just indulge. Good food, fizz and fun. That's my recipe for the perfect dinner party and one I serve up in my home as often as possible.